NEW! Effective Spring 2019, a permission number will not be required to enroll in an open class during the first week of the semester! You may add classes yourself, online in your Student Center. If instructor consent is required, a permission number is still needed to enroll. 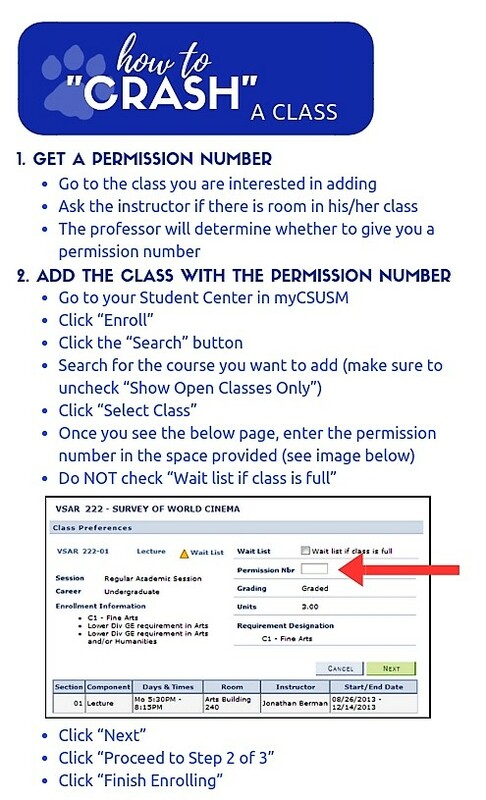 If a class is not displayed as “open”, a permission number is still needed to enroll. Refer to How to Crash a Class. During the second week of the semester, the only way to add a course will be with a permission number provided by the course instructor. You'll need to attend the class to see if the instructor will give you a permission number. Keep in mind, permission numbers are limited. Instructors will often use the waitlist to add students. If you are enrolled in a course you do not intend to complete, you are encouraged to drop the course prior to the start of the semester to avoid tuition related fees and negative grading. The last day to drop a class without recieving a W is February 4th. If you are a continuing student you may be eligible to take a CSU Fully Online course. More information on eligibility and enrollment in CSU Fully Online can be located here. The enrollment window for CSU Fully Online courses is limited, the link will only be available to you in your Student Center until January 21.